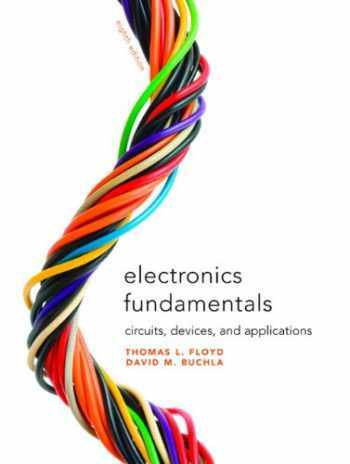 Acknowledged author Thomas L. Floyd wrote Electronics Fundamentals: Circuits, Devices & Applications (8th Edition) comprising 1088 pages back in 2009. Textbook and etextbook are published under ISBN 0135072956 and 9780135072950. Since then Electronics Fundamentals: Circuits, Devices & Applications (8th Edition) textbook received total rating of 4 stars and was available to sell back to BooksRun online for the top buyback price of $62.53 or rent at the marketplace. This renowned book offers a comprehensive yet practical exploration of basic electrical and electronic concepts, hands-on applications, and troubleshooting. Written in a clear and accessible narrative, the Seventh Edition focuses on fundamental principles and their applications to solving real circuit analysis problems, and devotes six chapters to examining electronic devices . Some key features include: “Symptom/Cause” problems, and exercises on Multisim circuits available at www.pearsonhighered.com/floyd Key terms glossary—Furnished at the end of each chapter. Vivid illustrations. Numerous examples in each chapter—Illustrate major concepts, theorems, and methods. This is a perfect reference for professionals with a career in electronics, engineering, technical sales, field service, industrial manufacturing, service shop repair, and/or technical writing.